Woman of the Month: A Dash of Neia! She's a young go-getter who is working to create positive change in the world around her. Neia Omer, an Atlanta native, is a woman with a vision that involves providing other women with an opportunity to live and enjoy life freely. Whether she's at school or working an event, she is always spreading positive energy and good vibes. Neia is definitely an inspiration to many, so I am excited to introduce her as our October Woman of the Month! She's a woman on the move. A graduate of Georgia State University (hey fellow Panther! ), Neia is continuing to further her education at George Washington University where she is studying International Development. As a young adult, Neia worked with organizations such as Operation HOPE, GSU's 1913 Society, Collegiate Entrepreneurs Organization and more. Because of her desire to help others, Neia would even organize her own community service efforts, from community garden cleanups to helping young students. Neia still has her hands in many projects including her own animated film, Project T.A.N.E (To Advocate for Necessary Education), which will bring even more awareness to the topic of educational rights for all. This film is in production now. She is also working to develop a women's outreach program at her father's hospital in Ethiopia which would provide women with informative workshops and other resources that they may need. She uses her platform to educate others. 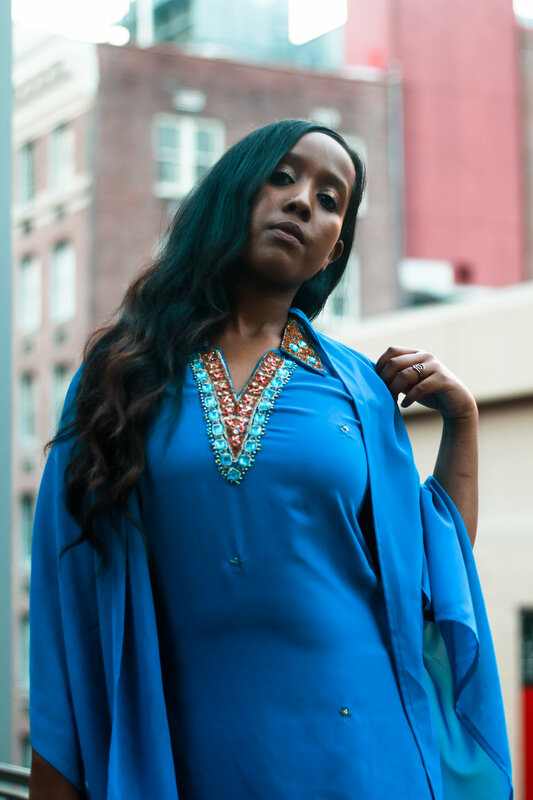 As an Ethiopian woman, Neia understands the struggles that women face globally - especially with receiving an education. She gained her inspiration to create change from her mother who didn't have the opportunity to focus on her academics when she was younger. Her parents have always expressed the importance of getting an education which led to her realizing that this is something she would like to shed more light on. She is committed to not only fighting for women's right to live and learn equally, but she is also working to educate others on this matter. "Sometimes you just feel that something is inside of you and that you have a voice that you need to use to share something." In order to spark conversation on the topic of women's education, Neia coordinated a screening of Girl Rising, a documentary that highlights the obstacles that nine girls face while trying to obtain an education. She made sure that women played an important role in this event by hiring a female photographer, a female caterer, etc. This was important to her so that women could come together for a common mission. She hopes to continue doing things of this nature to bring unite women and encourage them to get involved in making a difference. She is a light for all women. Neia's believes that true success comes when you're true to who you are and to your voice. She is also a firm believer that you should "build and cultivate your best self." "You have to just be confident in your voice, whatever that voice is. And that can only come from discovery...self-discovery." Another key to success that she suggests is to stay on top of your knowledge when it comes to your craft. In order to add value to whatever you do, you must sharpen your skillset from time to time. She also feels that a major aspect of achieving success is to HAVE FUN. Neia stated that a lot of her connections happened through her getting out and enjoying herself, so she recommends living life to the fullest. Neia is determined to make a huge difference in this world and is dedicating her life to do just that. Be on the lookout for what's to come in Neia's world!